Ok first, allow me to admit I'm well educated with enough years of work experience not to be trivially replaceable. I am married. I live in California where nursing publicly is protected by law and in Silicon Valley where work flexibility is ubiquitous. I have three children and thus knew what I wanted when my third baby came. Here is what "having it all" looks like in my experience. By my third baby, I knew what I wanted for my maternity leave. I wanted it all: Time with my baby and the intellectual stimulation of my job. I didn't push for time off. I asked for flexibility. HR and my manager acceded. Instead of full-time unpaid leave, I got a part-time arrangement with hours fully at my discretion. When my baby was 4 days old I attended a work party. When my baby was a couple weeks old I came to work but discovered my body wasn't ready for that much effort. I kept tabs on email daily. When my baby was 6 weeks old I came in for my first serious meeting. A vendor was presenting a bid for the project I was leading and I needed to know what the vendor had to say. It was my project. I didn't yet have childcare. I brought my baby. I was intimidated. I was afraid my manager would pull me aside later and reprimand me for nursing in a business setting, but participating seemed more important than a first warning. So I picked out clothes that would let me nurse discretely and did my best to act like it was totally normal that I had a baby at my breast as I asked tough technical questions. My manager said nothing. A co-worker later told me that the vendor interpreted my presence as a positive sign of serious interest; why else would a mom come in with a nursing six week old? I ramped up gradually from the 17 hours I worked in that sixth week up to 30-some hours by the time my baby was six months old. I worked from home. I brought my baby to morning meetings until she was 4 months old and demanded too much attention. I got an afternoon nanny for afternoon meetings. I had technical conversations while changing poopy diapers, me kneeling on the floor and my male co-workers standing above me. I loved it. In contrast, with my first baby a different employer expected me to either be at work working or at home on leave. I spent 4 months going crazy at home with the intellectual tedium of infant care and then spent 8 months going crazy working full time and pumping. There weren't enough hours in a day. The stress suppressed my milk production, so I had to pump more, so I had less time to work and sleep, so I didn't get enough work nor sleep, so I got stressed out, so my milk supply dropped. I hated it. With my third baby, I set the pace. And my employer benefited, too. If you add up all the part time, I took off far fewer hours in the first six months than if I'd taken the standard California leave. My project had continuity since I never stopped being available by email or for phone meetings. I never hid my baby's existence. Quite the opposite. I educated my co-workers to give them a chance for sympathy. Half of my closest co-workers are younger than me and don't have kids. Before my baby, one commented: "In a few weeks when you're back..." That was when I realized how important it was for me to set expectations. The guys I work with are passionate about our product and friendly. But some were pretty clueless about babies. So I explained the hassle of pumping, that I had only afternoon childcare but could bring the baby for morning meetings, that the baby woke up at night so I needed to sleep in some days. As the baby grew and my hours ramped up, I didn't hide the need to go pump and noticed my male co-workers initiating appropriately timed breaks at longer meetings. I gave my co-workers a chance to understand my work arrangement and, being nice people who wanted to keep my -- our -- project on track, they went along with it. This "having it all" business is possible, but it takes diplomatic initiative and a receptive environment. You want to go to work? Do it! And ask for what you need! You want to stay at home and raise kids? Great! Ask your husband for adult time! You want to do a little bit of both? Groovy! Flexible work places exist, but likely it'll take consistent initiative on your part to create what you need! Here's what we tell women and companies today: Give women more paid leave and it'll all be great. But you know what? Some women are both loving moms and motivated employees. Staying home on a long leave isolates them. Also, nursing babies need so much that going back to work full-time at 4.5 months when all that California leave ends (earlier in some states!) is rough. Why isn't flexibility and part-time a bigger part of the discussion? Among my friends those who had the best first year of motherhood had flexibility. Consistently. Flexibility to choose when and on what they work. Like me, most of my friends are well educated with careers: engineers, professors, lawyers, and so on. Like me, most of my friends have young children. I've seen a lot of friends become moms and those with the outstandingly wonderful first years of motherhood worked exactly as much as they could and not more. They worked. They didn't take unusually long leaves. But they worked on their own terms, setting their own hours and work priorities. And they all got a lot done; I don't think any of their employers were dissatisfied with that year's accomplishments. 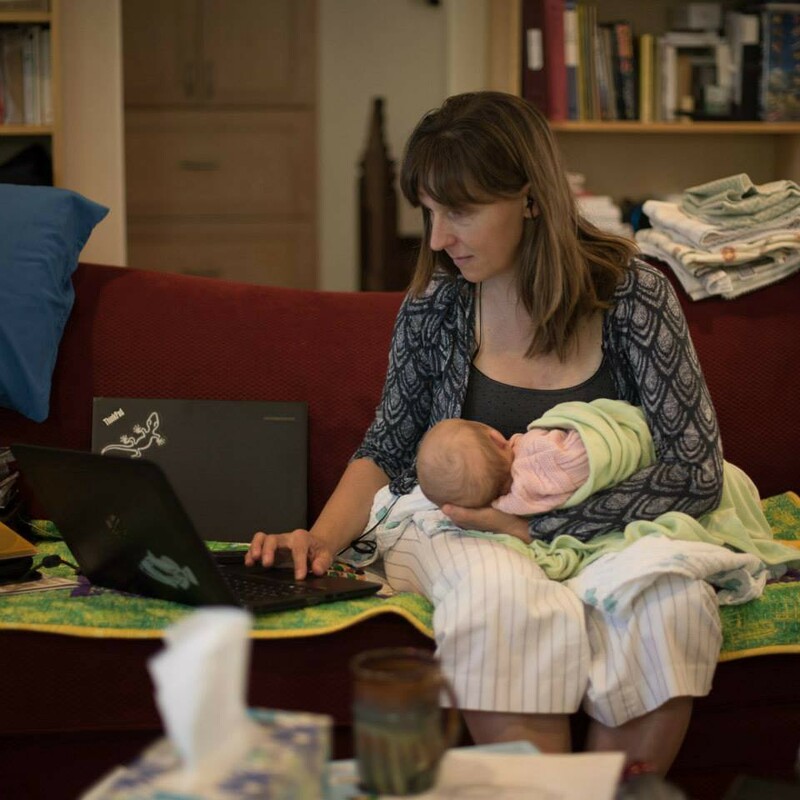 So while Amy Westervelt may not have found a way to "have it all" in the first month of her second baby's life, she's right that letting "each woman define for herself what the best version of her life might look like" will lead to happier moms and more productive employees.